You’d have to be a graduate in fruitology to be familiar with all the ingredients. But if you can track them down then you could have the recipe for a longer, healthier life. Scientists say they have developed a cocktail of seven fruit juices that boosts health, cuts the risk of heart disease and stroke – and tastes good. The ‘super-smoothie’ contains grapes, apples, blueberries and strawberries. Past studies have shown that compounds in fruit called polyphenols protect the heart and help prevent clogged arteries. 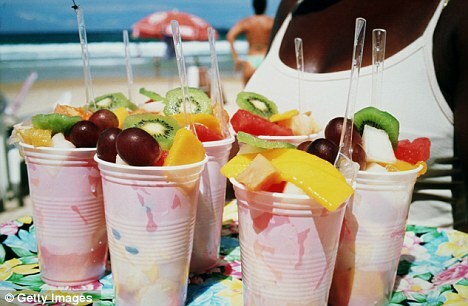 French scientists say their smoothie contains the healthiest and best tasting combination of fruit juices. Blends of 13 different purees and juices were analysed in a laboratory for their effects on pig arteries. But the finished recipe was selected after tests by 80 volunteers. In tests, heart artery walls relaxed when they were exposed to the fruit juice cocktail. The researchers, from the University of Strasbourg, say that in a human, this would boost the flow of blood to the heart and ensure it got a healthy balance of nutrients and oxygen. Tracy Parker, of the British Heart Foundation, said: ‘This research adds more weight to evidence that eating fruit and vegetables is good for us in terms of reducing our risk for heart disease. ‘However, we still don’t fully understand why, or whether certain fruits and vegetables are better than others. Even this study acknowledges that scientists can’t yet explain any link. ‘What we do know is that we should all eat a wide range of fruit and veg as part of a balanced diet, and fruit juice is a tasty and handy way of doing this.